What a load of old cop! Ba-dum-tsssh! If you thought that was bad, you won’t like this! 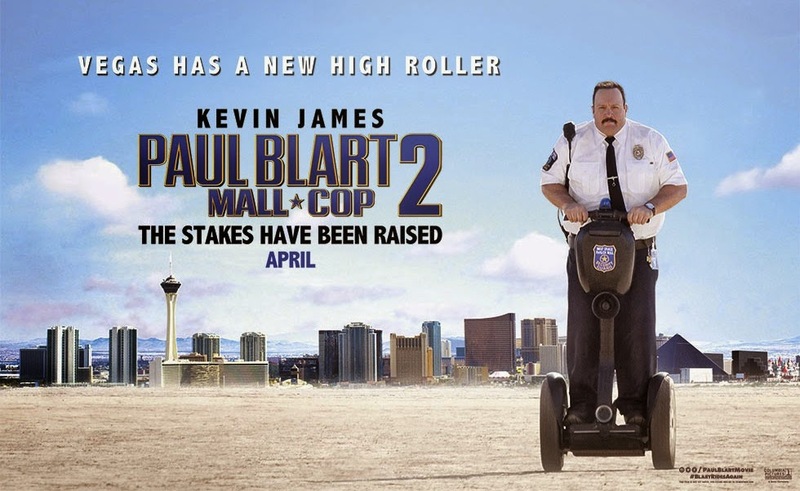 After six years of keeping our malls safe, Paul Blart (Kevin James) has earned a well-deserved vacation. He heads to Vegas with his teenage daughter (Raini Rodriguez) before she heads off to college. But safety never takes a holiday and when duty calls, Blart answers. Back, definitely bigger but better? In a word, NO! God, no! But it wasn’t all bad. Just . . . Not that good. I’ve been a fan of Kevin James ever since King of Queens. His movies may not have earned critical plaudits but as long as they were funny, I didn’t care. I finally got round to watching the first Paul Blart not too long ago. It was okay, I guess. James using his size to his advantage for some Die Hard buffoonery. It was watchable but the biggest joke was the amount of money it took! For all the hype and recommendations, I was left scratching my head. It delivered the odd titter but it went far too long. Too long at 90 minutes? Ouch. Inevitably, with all that box office wonga, a sequel was on the cards. Now bearing in mind, I wasn’t that keen on the first, I found that better than this instalment. The slating PB: MC 2 (Looks like an equation) has received was a little overkill. I did laugh. A couple of times. BUT it tried to outdo the first one and made the same silly mistakes. The opening ten minutes certainly didn’t get things going. It was a little dark and random. Two cast members from the original removed in a matter of seconds. One with a truck. The other . . . Obviously read the script and didn’t want to come back. Let’s be honest, Jayma Mays. You weren’t that good the first time round. BUT she still dodged a bullet. Some lazy plot writing about anxiety and demanding a divorce after a six day vomit inducing marriage or something or other. Yeah. Stupid and not very funny. See where I’m going. James’ OTT and deluded alter ego Blart did enough to preserve through the drudge. I can’t believe how big he’s got again! I thought he was shedding the pounds after Here Comes The Boom! Clearly, the film needed those infantile fat jokes. That popped up at every opportunity. However, considering his size, I couldn’t believe how quick James was on his feet. A scene in which Blart raids a hotel room for clues was hilarious. Running up the steps, throwing himself around, getting back on his feet. Damn! His buffoonery did get a few titters. But it was too much of the same thing. Tripping over the carpet in an epic hotel lobby punch up? Good. Continuing to trip over every object every 30 seconds afterwards? Boring. There wasn’t much of a story. Not that I expected one. But a lazy convention invitation to get Blart for more Die Hard shenanigans in a Vegas hotel was naff. It didn’t help that it was so predictable and schmaltzy. Rodriguez and James work well as a father/daughter unit but why did it have to be so revoltingly cheesy? Maya (Rodriguez) falls for a valet in a hammy and uninteresting sub plot. In fact you can hardly call it a subplot as Bakay and James couldn’t be bothered to put any effort into it. She inevitably avoids her blundering control freak of a mall cop dad who is in the middle of having a mini breakdown after losing the love of his life . . . after six days. Bleurgh. BUT that’s okay. She gets kidnapped . . . AGAIN! And it’s up to dear old dim-witted dad to save the day whether she wants him to or not! It’s just a mess. The main problem for me was that I was trying to work out how bad this film was. Let me explain. Nick Bakay (Salem! Salem from Sabrina. I know. GAY!) and Kevin James are funny. Surely, the dialogue and story line were written badly on purpose? You can see where James is ripping off the old clichéd action B-movies. His slow motion leap from a “fast moving” Segway got a chuckle out of me. BUT everything else just came off unintentionally bad. Boring and unfunny. It was as if they took all the bad bits out of the bad action movies to make something even worse. A comedy masterpiece or just bad? Either way, it didn’t really work. I mean, come on. Robert Rodriguez knew what he was doing when he made Planet Terror. It was a deliberately awful Grindhouse flick. Blart, on the other hand . . . Meh. The daughter getting kidnapped spiel didn’t work in Taken and certainly didn’t work in this. It had potential but never really got anywhere. The only redeeming feature was the fact she wasn’t a complete moron and did some clever MacGuyer stuff to try and escape. The supporting cast were a little hit and miss. Shelly Dusai was funny as Khan Mubi. Not enough of him to be honest. His impromptu hug and greets and inability to stay awake at even the most intense situations was a much needed comedy injection. I could have done with more of him than Gary Valentine or Loni Love. Love was brilliant when she was first introduced into the mix but after that, she soon got on my nerves. Yelling out, “This is real” and “That’s not real” got very old very quick. Neal McDonough was a cracking little villain. His different coloured eyes and deadpan delivery trounced the mall muppet that we had in the first one. But he wasn’t used to his full potential. He had keyed in his inner Hans Gruber and deserved more lines and screen time. Disappointed. I mean, his mad shout off with James showed McDonough’s potential. “I’m so crazy, I have two different coloured eyes. I don’t know what I’ll do next”. It doesn’t sound so good out loud but his delivery made it work. However, the shouting soon went on too long. AGAIN. D.B. Woodside should have stayed in Suits. Old Wayne Palmer was so bland and unmemorable. He was nothing more than a henchman. Daniella Alonso. Mamma Mia! Steady now. She played the alluring hotel manager well. What? It was a little funny when Blart kept insisting that she was hitting on him. His endless put downs and talks got a chuckle. The punchline inevitably being that she actually was hitting on him made me smile a little. Blart’s realisation at the mistake of turning her down was up there with Harry and Lloyd giving directions to that tour bus of models. I know James and Sandler have been slated for years. They don’t care. And to be honest, I’ve enjoyed quite a few of their efforts that have been rated incredibly low on IMDb but although this was watchable, it wasn’t memorable. It was along the lines of Grown Ups 2. It had a couple of laughs but went on too long and you couldn’t wait for it to end. BUT there were still laughs to be had. If you like your comedy silly and OTT and you liked the first one (A lot of people will be saying No one), then give it a crack. Blart getting in a punch-up with a peacock was hilarious. Its velociraptor-esque roar as it stalked the mall cop made it for me. That and the smiling pianist who offered no help and merely background music wasn’t bad. Looked like someone out of The Shining! James knows how to ride a Segway. I had a crash course on one of those. No, literally I crashed onto the floor. To be able to do the silly little tricks he does was fun to watch. Running into clean glass doors and sliding across hotel lobby floors were (Pardon the expression) hit and miss but they still got a little smile out of me. BUT James’ farting, tripping and blundering did annoy more than entertain. His ridiculous speeches were the sort of thing I fast forward through a naff B flick. The corny confrontations with Maya over moving away to college was so tedious and hammy. I really didn’t care. Oh and the final punch line, I say punch line was terrible. James chatting up a mounted policewoman could have had potential. BUT nah. Let’s just have a terrible CGI horse kick James’ terribly CGI’d body into a car. Shame. A missed opportunity. If there is going to be another, take another 6 years on top of another 6 years and find some better material, Messrs James and Bakay.